Location: Effiat, in the Puy-de-Dôme departement of France (Auvergne Region). Notes: Château d'Effiat is located in the town of Effiat, in the department of Puy-de-Dôme Auvergne (France). 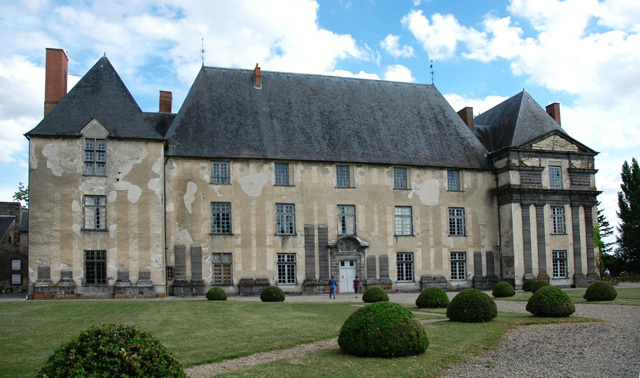 Château d'Effiat was part of a large project of Antoine de Ruze d'Effiat Coëffier says Ruzé friend of Richelieu and the king's counselor in 1625, whose lands were erected in marquisate in 1627 and became Marshal France in 1631. He appealed to architects Jacques Lemercier and Clement Métezeau and the gardener of the King, André Mollet to create a new city in Effiat the geometric layout. The castle was built from 1626 to 1628, and the church, the college of the Oratory and the hospital from 1630 to 1632. The city project was dropped to his death. Under the Old Regime, was in the castle, a military academy, the Royal Military School of Effiat, held by Oratorians. One of his most famous students was General Louis Desaix. The castle of Effiat was a historical monument April 16, 1942 and June 6, 1980 and registered again ranked 10 March 2004. A set of twelve paintings, probably dating from the period of construction of the castle (1625-1632) and inspired the Orlando Furioso of Ariosto, was initially held in the gallery of the castle. He is now at the Museum of Art Roger-Quilliot in Clermont-Ferrand. The garden, designed by André Mollet, consists in particular of a terrace, 130 m long, which is a cave (nymphaeum) flanked by staircases whose wall is lined with niches, an avenue and driveway. The castle garden is entered in pre-inventory of remarkable gardens.